Home / -News- / KISS / The KISS Organization Files to Patent the Phrase "The End of the Road"
The KISS Organization Files to Patent the Phrase "The End of the Road"
The KISS fan community is in an uproar today (February 19) after word came out that Kiss Catalog, Ltd., the organization that owns the intellectual property rights for everything Kiss, has filed a patent application for the phrase "The End of the Road". The application is specifically for a "Word Mark" for the use of the phrase in relation to "entertainment services, namely, live performances by a musical band." 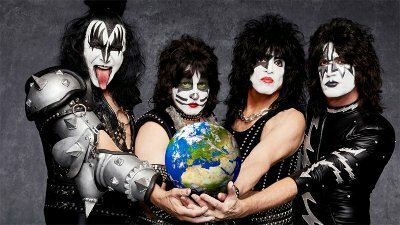 The general consensus is that the action was taken because KISS is ready to call it quits after one last tour which will use "The End of the Road" as the tour name or as a major part of their merchandise sales. What isn't being considered is that the band may be reserving the rights for the phrase in anticipation of a final tour that could be five or ten years down the road. Where KISS, specifically, goes has been part of the speculation and lore of the group for years. They mounted a "Farewell Tour" in the mid-90's but claim that the fan reaction was so strong that it was obvious they wanted the band to go on. Then there are the individual members. Simmons has said its not going to be possible for the band to continue to perform the way they do nightly, including very heavy costumes, when they are in their 70's. More recently, Paul Stanley said that the band could go on but he wasn't sure he could. "I have a family and I have children and, honestly, I think my primary responsibility is to be a dad, and I don't want to miss out on that. And certainly, as we got older, we know that life is finite and I pick and choose what I want to do at this point." Fans shouldn't get too upset at the moment. Patent applications can take some time to get through the government channels so don't expect this one to be granted anytime too soon. "The End Of The Road" is a phrase that simply shouldn't be considered for an egotistical, money focused patent. The end of the road is a common phrase in the English language. It's been used in songs, films, car advertisements, in literature. It's a phrase that's been used for centuries. No one has the right to claim it for their personal profitable gain. Then again, KI$$ were always about commercialization and facade, so this greedy KI$$ manoeuvre is typically shallow and predictable. No judge in any U.S. court of law would grant the KI$$ egos, the right to trademark The end of the road- a phrase that's a lot older than they are.